First, I would like to point out that I just happen to be on a TV show, it isn’t about me, and I’m hardly on it. THAT BEING SAID, I still find it rather exciting to see myself on TV so….let’s talk about it. It’s about the a cappella tournament that I work on, the International Championship of Collegiate a Cappella – ICCA. I run our South region, which means that I organize and travel to 6 or so competitions each spring, culminating with Finals in New York. That’s what the show is about! Basically it runs through the different levels of the competition, and last week was the episode about my quarterfinal (basically the first round) that featured 2 groups the show was following. Of the 2 groups, one advanced to Semifinals, so there will be another show featuring one of my events. There are some strange things that happen when you see yourself on TV. First, even though I was filmed all season for it, I still was kind of….shocked…to see myself on TV? It’s just unnatural. I’m not an on-TV kind of person. I also don’t have an image of myself on TV because…I don’t know? I’m not the star? They don’t exist? I’m fine with it. Then, all the things that I SHOULD be doing with my appearance sets in. WHY do I refuse to pay for highlights? Are tanning beds REALLY that bad for you? Why do I eat, at all, ever? You know, normal stuff. On opposite day. Overall, though, I LOVE seeing “my” kids on the show. There is of course some stuff that is sooooooo totally not real life, but the competition is depicted pretty accurately, and most of the stress and drama, for better or for worse, is actually happening at these shows. The students work ridiculously hard to even make it to the first round of competition, and seeing their hard work be televised for all the world to see is just so exciting for them. Also, the crazy loud personalities that already exist in real life are totes played up on TV, as personalities always are. SO, tonight, set your DVR for Sing It On! 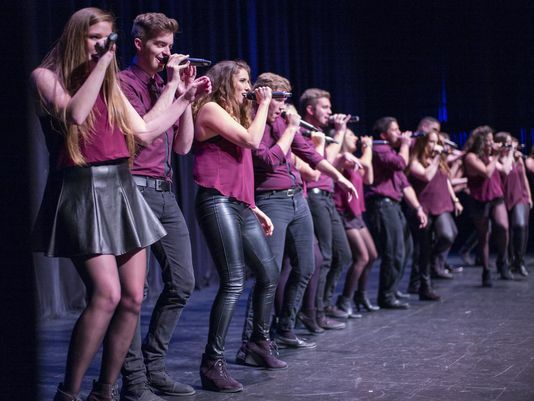 Watch, giggle, love, and then next year find an ICCA show in your region and come see us! Lots of dates are already set and you’d LOVE IT. Real Pitch Perfect, all that jazz. Because, it actually is.